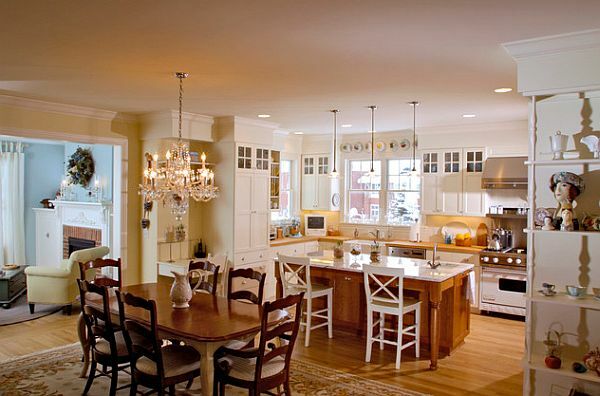 Old is gold, so as your remodel your kitchen keep this in mind. 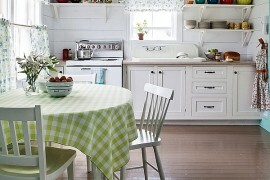 For a country themed kitchen is always in style due to it efficiency and charm. 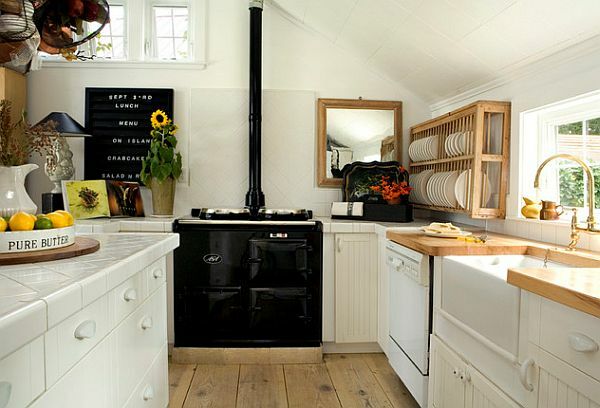 Upcycling and reinventing the farmscape kitchen just got easier when you keep in mind a few tricks to keep it authentic. Remember the good ol’ days when you were awoken by the rooster crowing? You threw off a handmade patchwork quilt and made your way down knotty, creaky steps and there it was: The prominent feature of the kitchen that represented livelihood and sustenance. This wonder, commonly known as a stainless steel milking pail, was the shiniest part of the room and integrated itself as the vista of the kitchen. Fluttering, floral curtains, a creaky screen door to match the steps, weathered buttercream cabinets, and an exposed beam overhead completes the look. Ah, how precious and relaxing that sounds. 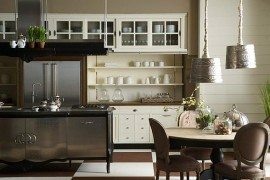 And how wonderful would it be to remodel your kitchen catching the spirit of simpler times in an embellished rustic country kitchen atmosphere? Here’s how to you translate this scene into your suburban modern home, in which your towns closest resemblance to a farm is the Target Greatland and its dairy section. Implement as many raw and organic materials in the foundation and basics of your kitchen and try to avoid any synthetics. 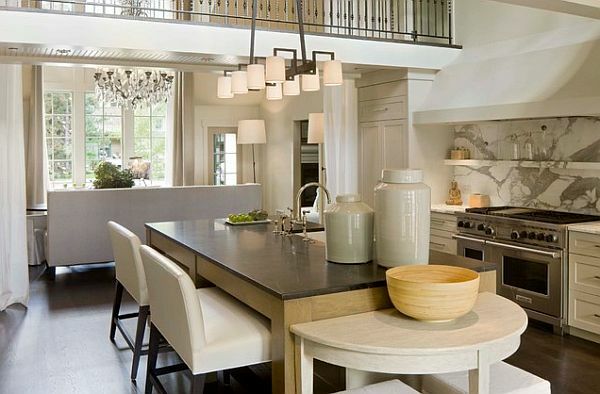 A butcher-block counter top is a great way to bring in a country element as well as the zinc topped rectangular kitchen table featuring a strong and bold wooden base that speaks the same language as your countertop. 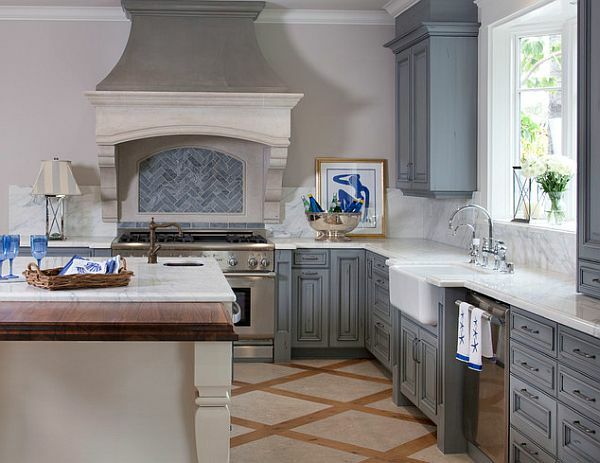 For your base choose a neutral and natural stone tile that isn’t too light. A country kitchen sees a lot of dirt! Sometimes living on a farm means being too far from town to even consider a quick trip. Take “We Bought A Zoo,” for an example. It was corn on the cob night and when the Mee’s realized that there was no butter there was a real dilemma of whether the round trip to town for a stick of butter was worth it. 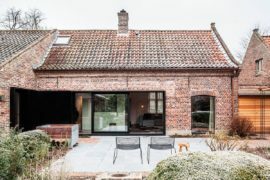 Time, distance these factors play a role in country living, and so you use what you already have, which is great for the budget and expands our design experiments. 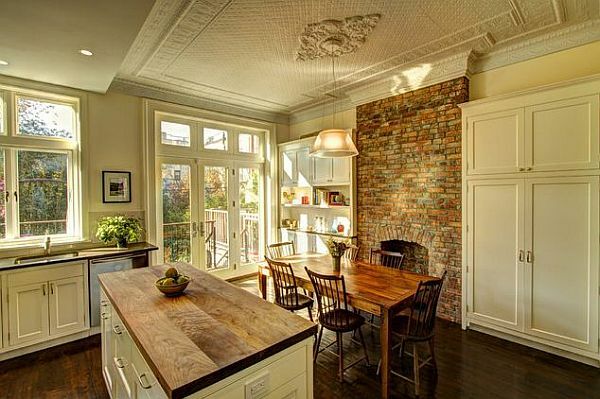 Use pieces of salvaged goods to make a statement in your kitchen. Dress up your cabinets and create a conversation piece by using vintage ceramic cross knobs from an old bathtub or sink as your cabinet handles. From hand written recipes, old photographs and even old silverware the sentimental family heirlooms we inherit should be celebrated daily, not kept hidden and forgotten in storage sheds. Frame the recipes in shadow box frames and turn your forks into wall hooks by curling up the handle part. 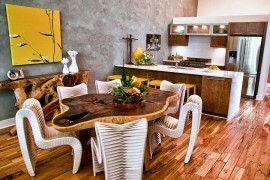 It’s simple ways like these thay you can utilize what you already have and turn them into utilizable décor. Double benefits! Be intentional with you choices and forego clutter and excessive items. Bring in a rustic bakers shelf for a place to store your plate-wear and mugs. This frees up more space in your cabinets and turns your everyday kitchen essentials into a simple but profound decorative storage unit. 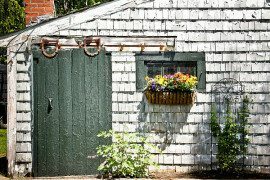 Often the country kitchen doubled as mudroom so have a place to hang a hat and place to collect the dirt from your boots keep everyone honest as to who really left the mud prints on the freshly scrubbed floor! 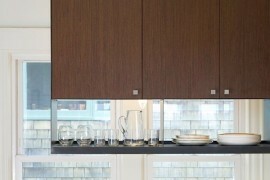 Another way of maintaining storage is just hanging out: Or hanging up, in this case. If you have beams to expose, now is your chance to let the world see them! 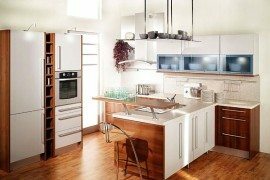 From streamline chandeliers to pots rack above head, making kitchen appliances easily accessible and your units that fill the above head space become tre’ country. 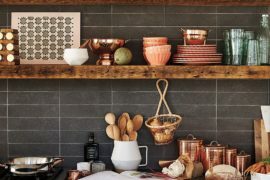 Having your cooking post and pans at a finger grasp away is a comfort and eases the mind when it comes to searching for pots in a messy stacked mess in a bottom cabinet. All that bending and crouching and your back will hurt worse than Farmer Browns after a day of years of sitting on tri legged stool as he hand milks dear sweet Bessie into the stainless steel bucket that started this entire discourse. I assume your neighborhood is free of cattle, grain scrounging chickens and the crisp air of farm life but the authentic closeness felt in your kitchen with its mismatching chairs and fridge filled with farmers market produce will bring you a little closer to country and help you forget about the smog you live amongst. Happy eating!